I am so excited to share this little labor of love with you all. 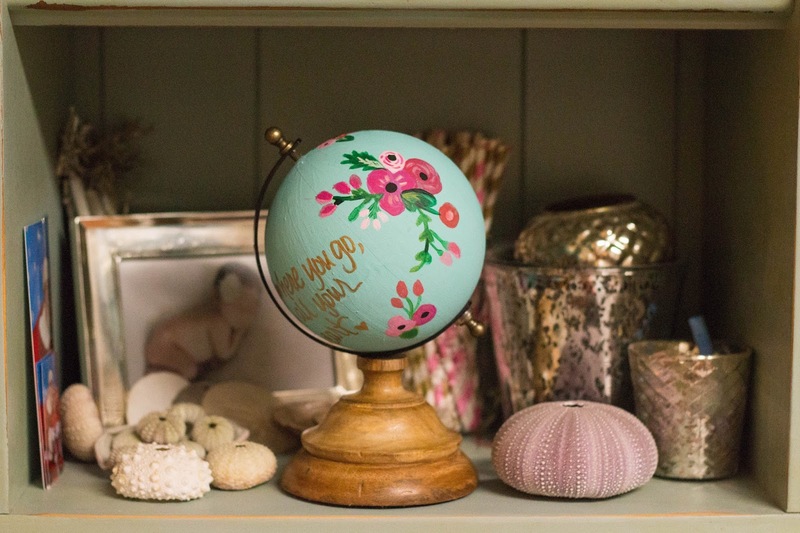 I had always wanted one of those adorable hand painted globes I saw at Anthropologie last year. But the price tag was woof and I mentally pinned it in my mind to try and recreate. 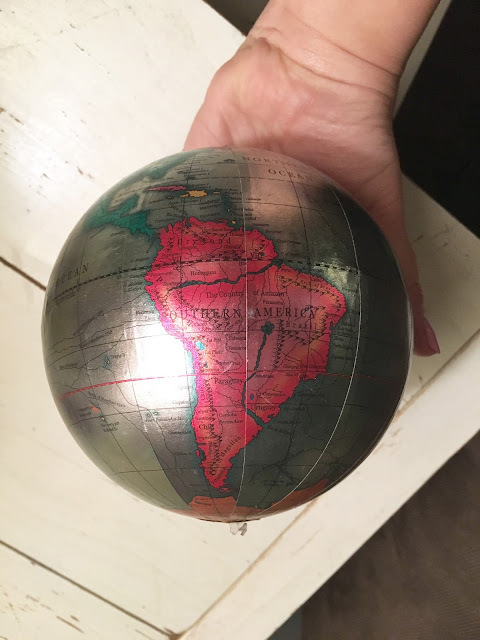 Although globes are easy to come by I was on the hunt for one that had a stand I really liked. So when I spotted this little lady at Home Goods for $7.99 I was sold. 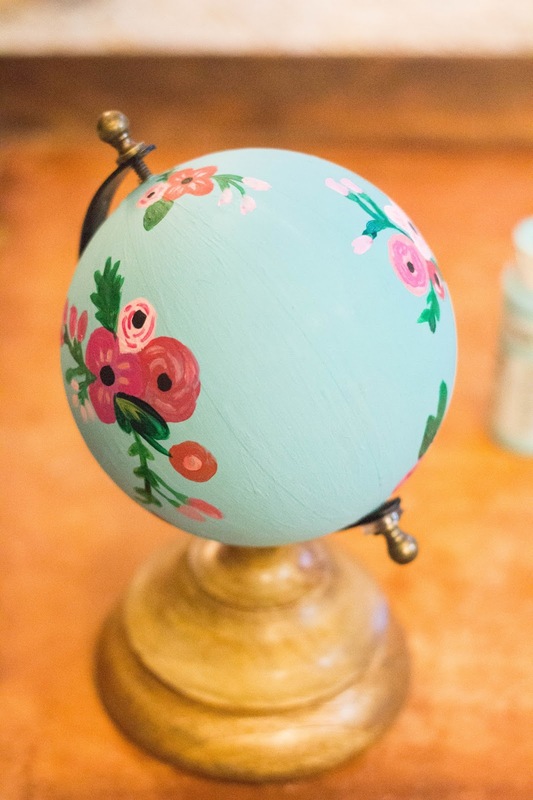 This is a before of the globe. 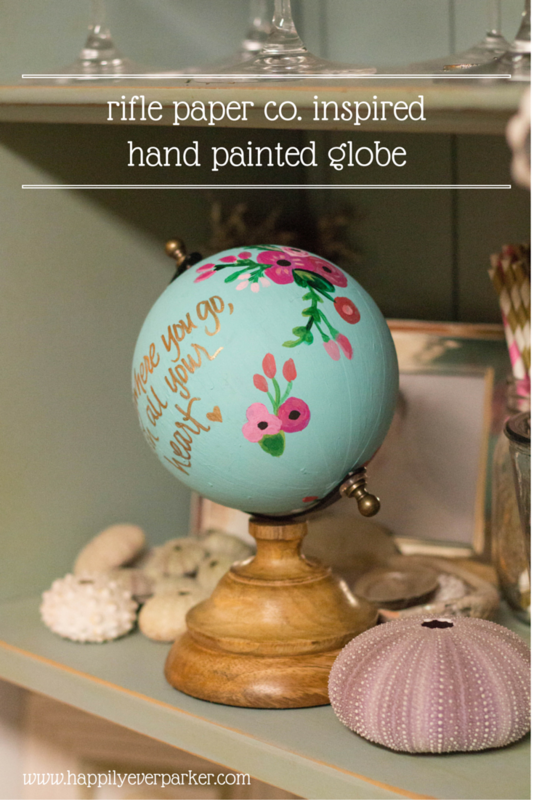 It was just a simple sphere covered in a paper map. I considered peeling the map off but didn't want to worry about texture issues. So I just decided to paint over it. 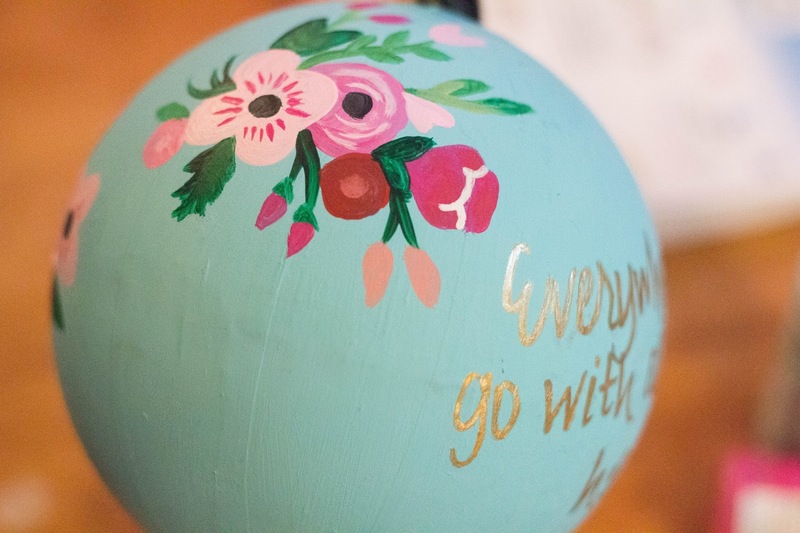 I already had paints on hand from P's floral first birthday, so that is what I used for this project. 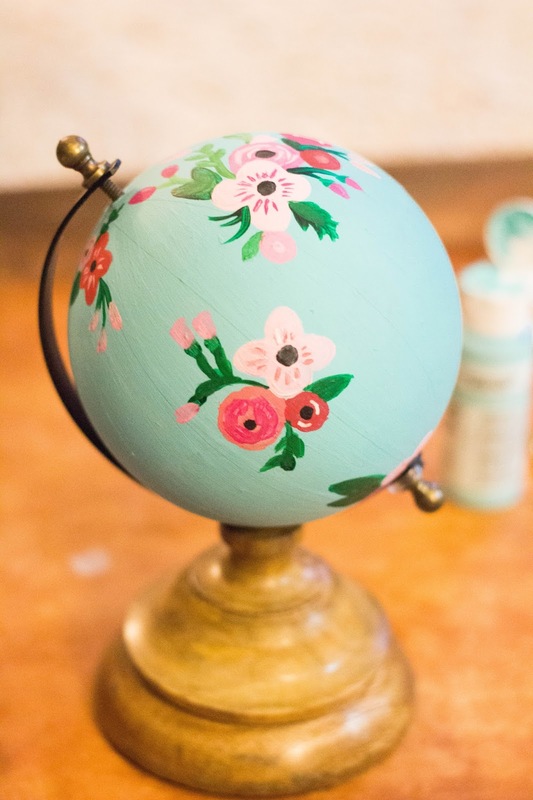 First was painting the globe a light blue. I did two coats and let it dry overnight then I started on the flowers. 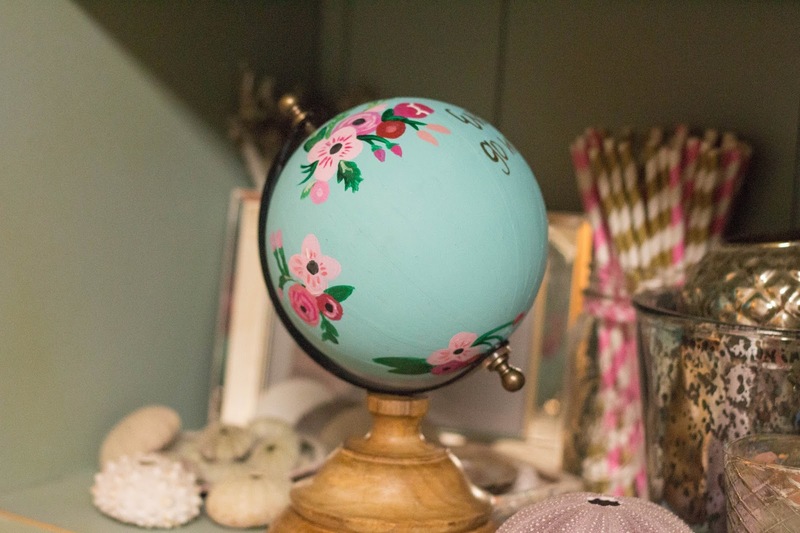 Using my favorite Rifle Paper Co. flowers as inspiration along the way. There is so much I love about this saying, especially at this point in my life. I feel like it takes us so long to figure out the things that make us happy. So I hope that whatever my daughter decides to do or pursue she always does it all in, heart fully invested. Follow your heart but bring your head was a close runner up ha! I used a regular gold sharpie (although in hindsight a paint pen would have been easier) and then I took a gold jellyroll pen and wrote over it. Like I said it took about 10 times before I was happy with the way it looked! Luckily I could just paint over it if it didn't look good! I wish I was a calligrapher because I can only image how cool that would look but my penmanship will have to do. So there you have it! I am tempted to add one more section of flowers closer to the quote and spray the metal part gold. For now though that will do! You did such a beautiful job! Love the colors! I just can't get over how beautiful it is!! I love this! Your handwriting looks so pretty and those flowers.. you've got skill my friend! I LOVE this! I would totally buy one from you! This is so adorable!! You did an amazing job my friend! This turned out so perfectly! I am obsessed! And your penmanship is beautiful! Seriously, I would kill for some of the things I write to look so fancy! Wow, this looks great! I love the flowers, you did such a great job!! So pretty! I wish I had ANY artistic talent! Love this! Your daughter will cherish this forever...especially since it is written with your handwriting. It looks so professional! You are seriously talented friend! 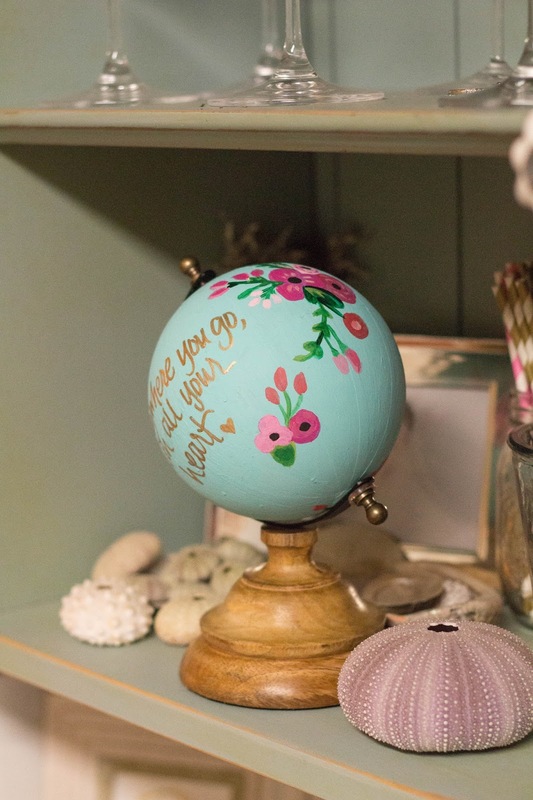 I cannot believe you just free handed those flowers! I love everything about this! I wish I was that crafty! Awesome job! I'm so impressed - it's beautiful! It turned out so pretty!! 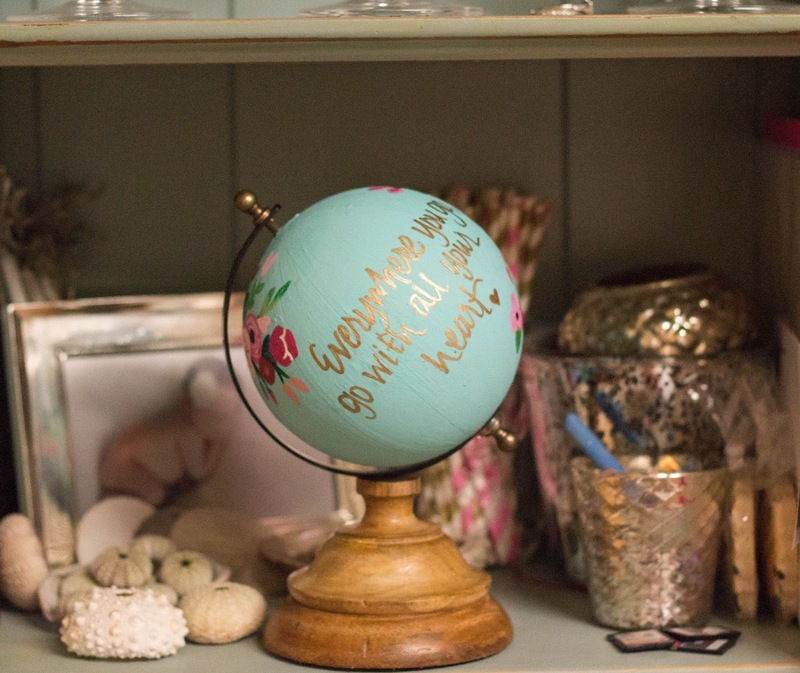 And I LOVE the quote - it's perfect! Laura, this turned out AMAZING. I saw you posted about it on your instagram and I was really hoping you would post a tutorial. I want to make one too! You are so talented!! I would never in a million years be able to pull that off!! This is gorgeous!! 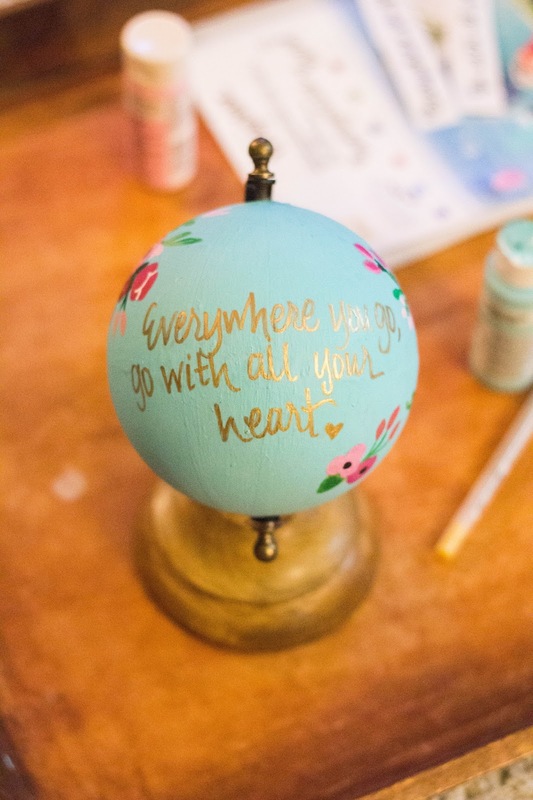 You did such an amazing job and this will be something your daughter will treasure forever! Amazing!!! It turned out so beautiful! 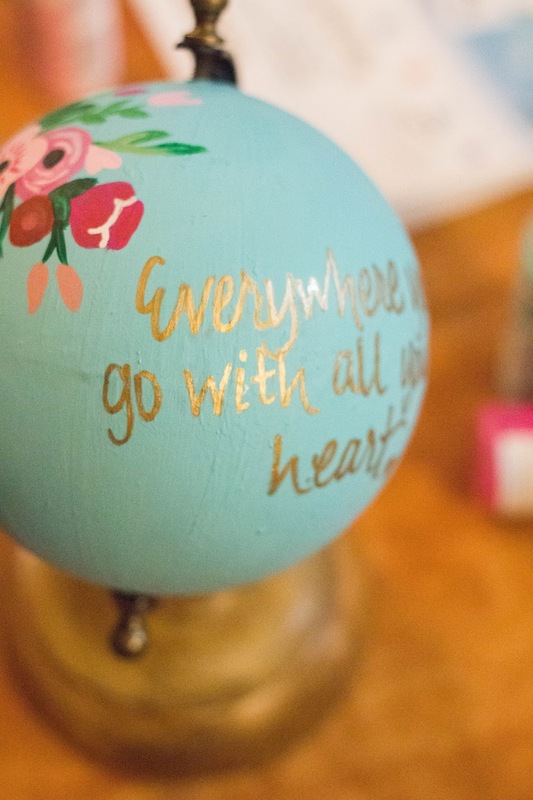 I pinned it because I want to make one for our house. And each of my kids. Ha ha! This is adorable! Good job! I love love love the quote! You did an AMAZING job! I LOVE this. I seriously wish I could bold and make love bigger because seriously, I'd totally pay money for that!